It’s probably not a stretch of the truth to assume that many people have financial difficulties occasionally. Of course, for some people it happens more often than others. But one thing that doesn’t help is counting on luck to improve your finances. For most of us there is no pot of gold at the end of the rainbow. No wee leprechaun with the secrets to fortune. Rather than playing the lottery or risking money at the blackjack table, maybe you should make your own luck. 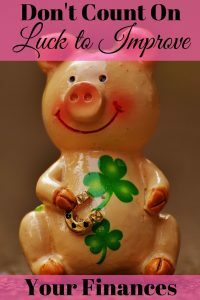 Instead of counting on luck to improve your finances take control of them yourself. Start out by making a budget that works for you. First, gather together all of your outstanding bills and debts. Use them to create a list or spreadsheet so you know everything you owe money on. Use this data to figure out how much your bills are every month. Make sure you include things that are not paid monthly. These may include car tags and taxes, property taxes, and doctor bills to name a few. Next, compare these numbers to your monthly income. Should you have money left at the end of each month yet the reality is that you run out? If so, start tracking the extra things you buy that were not included in your budget. Once you know where the money is going you can make changes to help improve your finances. For instance, stop buying a coffee every morning before work or eating out for lunch each day. Changing these negative spending behaviors can improve your finances. Now that you have a handle on where and how you are spending your money you can begin eliminating debt. But don’t rely on cash windfalls, such as tax refunds or work promotions to do it. Look for alternative ways to cut your expenses and keep more money in your pocket. Still, if you are lucky enough to get extra cash you can use it to make more debt progress. Remember every dime you pay toward debt will improve your finances. One tip that can help you pay debt faster is to try to negotiate bills that you owe. Some creditors will work with you more readily than others, though. A few bills to try negotiating are cell phone bills, medical bills, and utility bills. 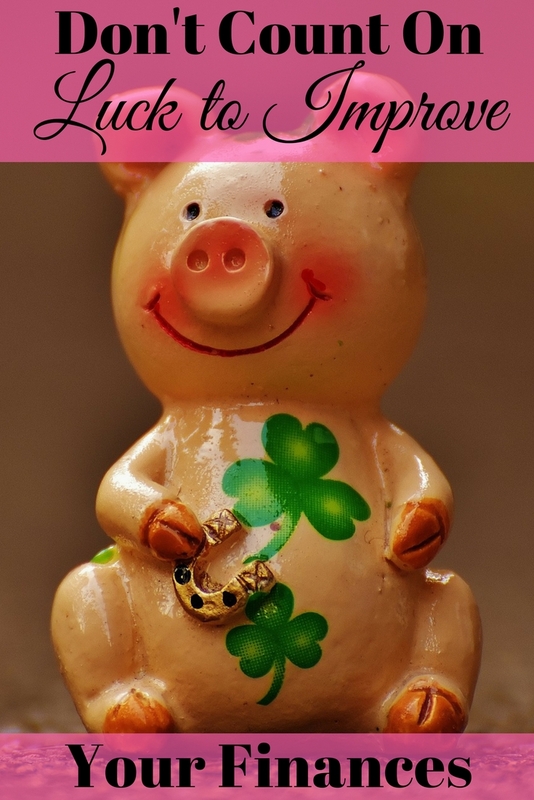 Another way not to count on luck to improve your finances is to create an emergency fund. Most likely, no one is going to rescue your finances if you get in trouble. When your car breaks down or your refrigerator quits using a credit card for repair bills is not the answer. This will simply dig you further into debt. To get ahead of these types of issues before they happen, start an emergency fund. Even if you can only put $5 toward this fund some months you are still making progress. After you commit to living frugally, paying debt, and saving it gets easier to save even more. Consistence and diligence with your finances creates habits that will make a difference in the long run. In order not to count on luck to improve your finances you could also pick up a side hustle. It’s a great way to help meet monthly bills, pay off debt, and build your emergency fund faster. Some examples of easy side hustles are filling out online surveys for cash, babysitting, tutoring, or mowing lawns. But there are plenty of other ways to make extra money too. Certainly the battle toward financial freedom can be a long one and not won overnight. But it helps if you don’t ignore the problem or worse yet count on luck to improve your finances. Use these tips to help you get out of debt and take control of your finances. What measures have you taken to improve your finances? Finance plays an important role in everyone’s life and can make or break your future. You’re right that it is important. Thanks for your comment. Yes, I feel like real luck is, to a certain extent, “made” by working hard. Good fortune and good finances don’t just fall into your lap. You have to earn them most of the time.